Discover the hotel, hospitality, facility management, and cigar industry projects within our portfolio. Our current and future hotel, accommodation, and hospitality venues are setting the benchmark in their respective sectors. We welcome your interest in our projects and services and look forward to discussing new proposals and forming mutually beneficial partnerships. Inspiring Hotels and Serviced Apartment projects across Malaysia. With hotels and serviced apartments in Kuala Lumpur, Johor, and Melaka, we have the perfect stay waiting for you. Whether you’re planning a business trip or holiday to our locations, we will make you feel at home. Our hotels and F&B outlets are located within major tourist areas ensuring you don’t miss a thing. 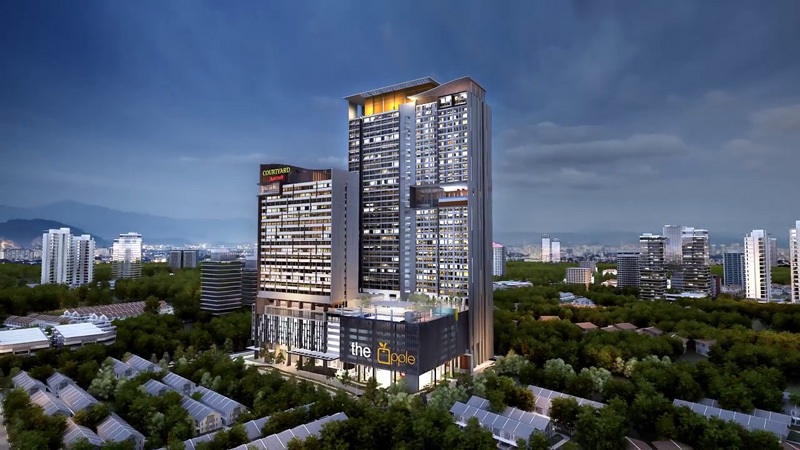 The Trinidad Signature Suites project, also known as “The Apple” Melaka, is a 39-storey serviced apartment project due to be open in Q4 2018. Freehold tenure with Strata Title is being offered to investors with a fixed rate of return of 6% p.a. for first 10 years; Subsequently 5+5 years Renewal Options on Revenue Sharing Basis. Trinidad Signature Suites directly own and/or manage several hotels and serviced apartments in Malaysia. Development and operation of hotels, serviced apartments and accommodation venues. We would love to hear from you. Please contact us regarding new and current projects we’re working on.